With 47 percent of adults over the age of 30 having some form of periodontal disease, and a whopping 70 percent of adults over 65 showing signs of the disease, the Center for Disease Control calls periodontal disease the “biggest threat to dental health.” So, what is it? And how can you prevent it? Periodontal disease is the result of inflammation and infections on the gums and bones surrounding the teeth. In its earlier stages, gums are usually swollen and red. However, if left untreated, periodontal disease can cause gums to pull away from teeth – causing teeth to become loose, and even fall out. According to the CDC, men are at higher risk than women (56 percent compared to 38 percent, respectively). Smokers are also at a heightened risk of periodontal disease. The CDC lists several warning signs for periodontal disease. First, as previously stated, gums are swollen. Second, persons with periodontal disease usually have bad breath or a “bad taste” that will not go away. Chewing can also be painful, and users may feel more sensitivity in their teeth than normal. 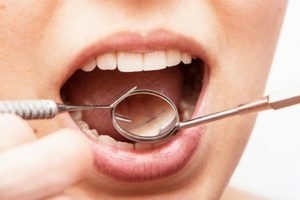 If the disease has progressed, gums may have pulled away from the person’s teeth or there may be a change in the way a person’s teeth fit together when they bite. If a person has dentures, then any change in the fit of the dentures could also be a sign of periodontal disease. First, and most important, be sure to brush and floss twice a day to remove the type of bacteria that cause gum disease, and ultimately leads to periodontal disease. Second, see a dentist at least once a year for checkups. If a person is experiencing any of the warning signs listed above, then seeing a dentist immediately is recommended.